Little voracious aliens known as the Crites escape to Earth with a pair of shape shifting bounty hunters, Ug (Terence Mann) and Lee, not too far behind them. The Crites hide out on the Brown farm. The youngest Brown, Brad (Scott Grimes) and greasy weirdo/hired hand Charlie (Don Opper) realize something is terribly wrong but they may not be able to save the rest of the family before there are eaten by the Critters or caught in the crossfire of the bounty hunters. This movie was a childhood staple for me. It arrived hot in the middle on a wave of ‘little monsters’ movies, spurred on by the overwhelming success of ‘Gremlins’ (1984). 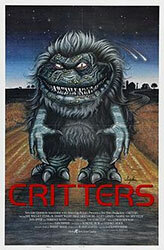 As much as I loved ‘Gremlins’, I loved ‘Critters’ even more, mostly because it's far more outlandish and violent. The Crites have a few neat tricks like shooting poison quills and growing bigger as they eat. They aren’t terribly threatening but it’s fun to watch them do their thing. It’s pretty much the perfect movie for a twelve year old and I still find it very enjoyable, which probably says something about my maturity level.